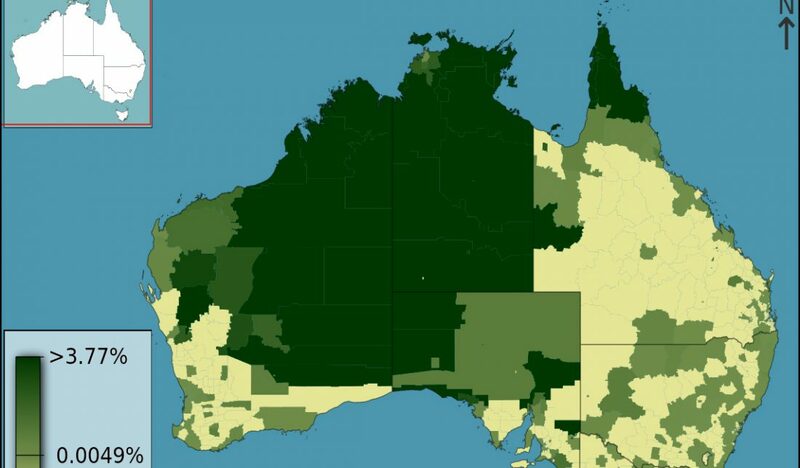 Yet another questionable paper by Nature, The origin and expansion of Pama–Nyungan languages across Australia, by Bouckaert, Bowern & Atkinson, Nat Ecol Evol (2018). Even with my absolute lack of knowledge on Australian languages, I am not conviced. Not at all. I have already expressed more than once my opinion on Glottochronology – and the improved method of this paper seems like the final twist of the screw for its strongest proponents. Interestingly, this paper includes the same journal, author, and (mostly) method of the famous Language-tree divergence times support the Anatolian theory of Indo-European origin (2003). And we have also seen how most suggested prehistorical cultural diffusion events were actually migrations, so it seems rather odd to dare publish this right now. At a time of groundbreaking genomic papers being published on South-East Asian migrations, and probably expecting more on the region – including Australia – , this paper seems to me quite unnecessary. It will especially not help Nature make forget its latest fiasco on Indo-European migrations. Interesting preprint at BioRxiv by the team of the Reich lab, Population Turnover in Remote Oceania Shortly After Initial Settlement, by Mark Lipson, Pontus Skoglund, Matthew Spriggs, et al. (2018). Ancient DNA analysis of three individuals dated to ~3000 years before present (BP) from Vanuatu and one ~2600 BP individual from Tonga has revealed that the first inhabitants of Remote Oceania (“First Remote Oceanians”) were almost entirely of East Asian ancestry, and thus their ancestors passed New Guinea, the Bismarck Archipelago, and the Solomon Islands with minimal admixture with the Papuan groups they encountered. However, all present-day populations in Near and Remote Oceania harbor 25-100% Papuan ancestry, implying that there must have been at least one later stream of migration eastward from Near Oceani>. We generated genome-wide data for 14 ancient individuals from Efate and Epi Islands in Vanuatu ranging from 3,000-150 BP, along with 185 present-day Vanuatu individuals from 18 islands. We show that people of almost entirely Papuan ancestry had arrived in Vanuatu by 2400 BP, an event that coincided with the end of the Lapita cultural period, changes in skeletal morphology, and the cessation of long-distance trade between Near and Remote Oceania. 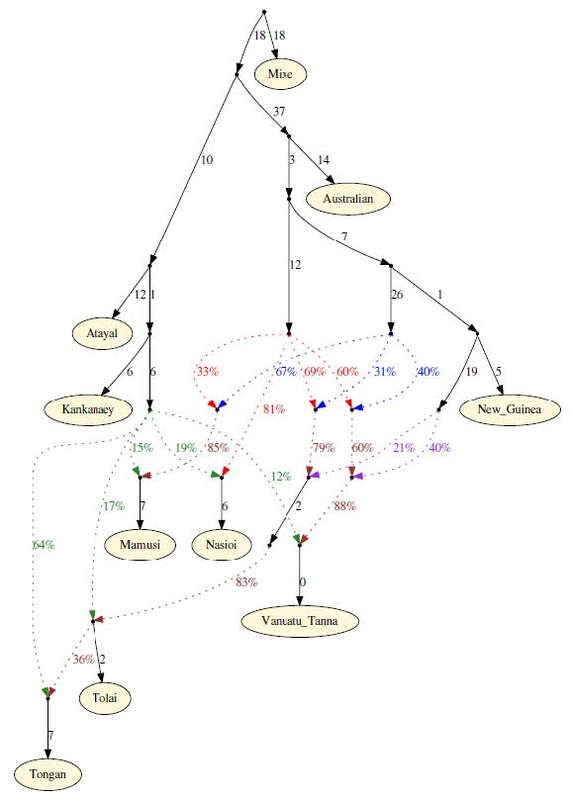 First Remote Oceanian ancestry subsequently increased via admixture but remains at 10-20% in most islands. Through a fine-grained comparison of ancestry profiles in Vanuatu and Polynesia with diverse groups in Near Oceania, we find that Papuan ancestry in Vanuatu is consistent with deriving from the Bismarck Archipelago instead of the geographically closer Solomon Islands. Papuan ancestry in Polynesia also shows connections to the ancestry profiles present in the Bismarck Archipelago but is more similar to Tolai from New Britain and Tutuba from Vanuatu than to the ancient Vanuatu individuals and the great majority of present-day Vanuatu populations. This suggests a third eastward stream of migration from Near to Remote Oceania bringing a different type of Papuan ancestry. Admixture graph model with inferred parameters, alternative visualization. Branch lengths are given in units of f2 genetic drift distance times 1000, and admixture proportions are indicated along corresponding dotted lines. Red, Solomon Islands majority source; blue, Bismarck Archipelago majority source; purple, New Guinea-related source; green, First Remote Oceanian; brown, mixed ancestry. The order of admixture events specified is arbitrary. 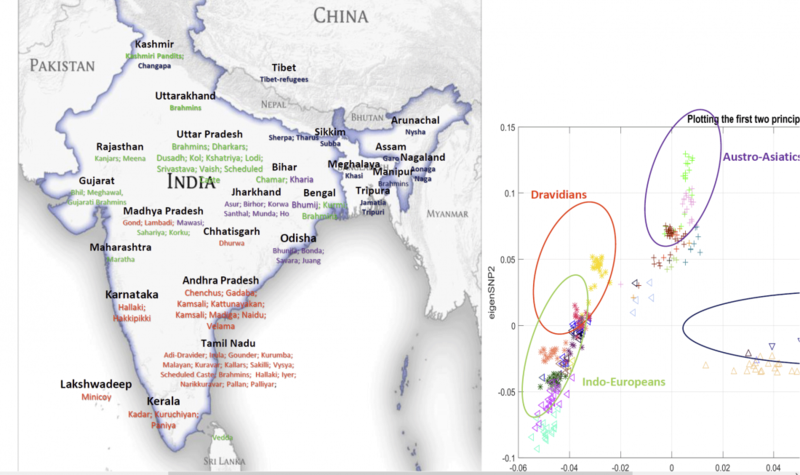 Preprint paper at BioRxiv, Dissecting Population Substructure in India via Correlation Optimization of Genetics and Geodemographics, by Bose et al. (2017), a mixed group from Purdue University and IBM TJ Watson Research Center. A rather simple paper, which is nevertheless interesting in its approach to the known multiple Indian demographic divisions, and in its short reported methods and results. India represents an intricate tapestry of population substructure shaped by geography, language, culture and social stratification operating in concert. To date, no study has attempted to model and evaluate how these evolutionary forces have interacted to shape the patterns of genetic diversity within India. 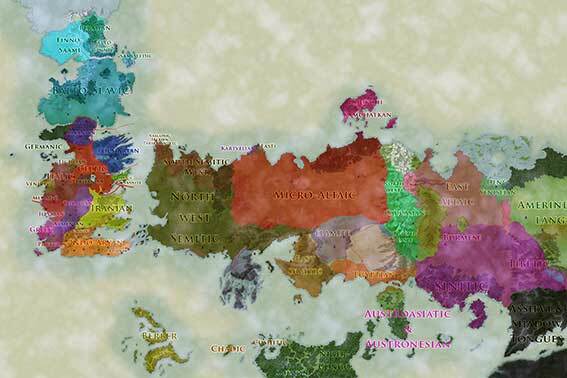 Geography has been shown to closely correlate with genetic structure in other parts of the world. However, the strict endogamy imposed by the Indian caste system, and the large number of spoken languages add further levels of complexity. We merged all publicly available data from the Indian subcontinent into a data set of 835 individuals across 48,373 SNPs from 84 well-defined groups. Bringing together geography, sociolinguistics and genetics, we developed COGG (Correlation Optimization of Genetics and Geodemographics) in order to build a model that optimally explains the observed population genetic sub-structure. We find that shared language rather than geography or social structure has been the most powerful force in creating paths of gene flow within India. Further investigating the origins of Indian substructure, we create population genetic networks across Eurasia. We observe two major corridors towards mainland India; one through the Northwestern and another through the Northeastern frontier with the Uygur population acting as a bridge across the two routes. Importantly, network, ADMIXTURE analysis and f3 statistics support a far northern path connecting Europe to Siberia and gene flow from Siberia and Mongolia towards Central Asia and India. Our meta-analysis of the ADMIXTURE plot in Figure 4A quantifies the ADMIXTURE results (darker colors indicate higher pairwise shared ancestry). Indian populations show a greater proportion of shared ancestry with the so-called Indian Northwestern Frontier populations, namely the tribal populations spanning Afghanistan and Pakistan. Central Asian populations share higher degrees of ancestry with IE and DR Froward castes. Uygurs share high degrees of ancestry with Indian populations. f3 statistics (all negative Z-scores are shown) indicate Chinese and Siberian ancestry contributing to the Tibeto-Burman tribal speakers. On the other hand, the Mongols and the Europeans have contributed significant amounts of ancestry to the Indo-European and Tibeto-Burman forward castes. F3 statistics also show that the Central Asians are an admixed population with signs of admixture from Caucasus and other parts of Europe. Among the results for proportions of shared ancestry between Indians and Eurasians (FIG. 4), there is an obvious influence of European admixture (Caucasus, and Southern, Central, and Northern EU), potentially from the Yamna-Corded Ware expansion, in IE_ForwardCaste, which is lessened in IE_BackwardCaste and also in IE_Tribal, while DR_ForwardCaste shows again more admixture than IE_Tribal, but diminishing with lower castes and quite low in DR_Tribal. 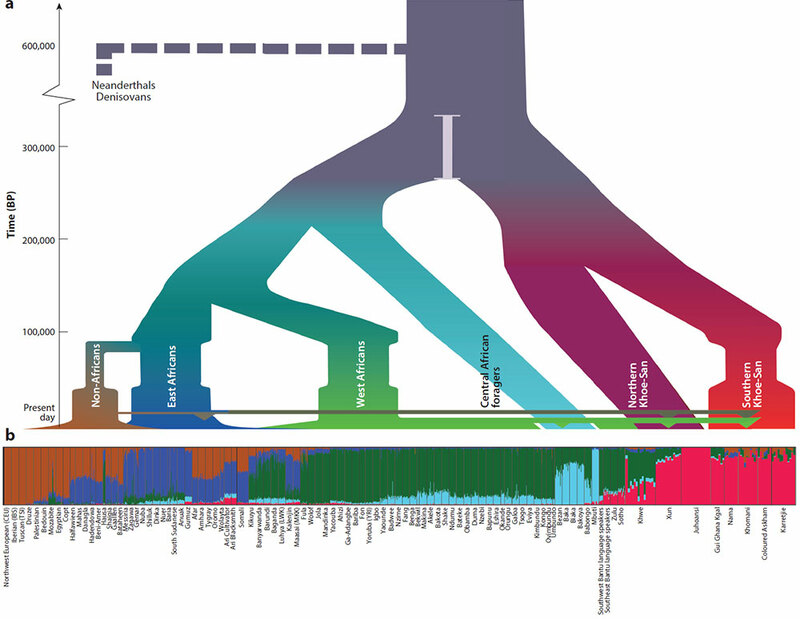 Ancestry from Central Asia is strong with a similar pattern, which hints at the influence of Sintashta, Andronovo, and BMAC influence in the expansion of the Steppe component, even more than a later Turkic component. On the other hand, the influence from Turkey is difficult to assess, given the complex genetic history of Anatolia, but the map contained in Fig. 6 doesn’t feel right, not only from a genetic viewpoint, but also from linguistic and archaeological points of view. This is the typical map created with admixture analyses that is wrong because of not taking into account anthropological theories. Quite interesting is then the influence of admixture in these different ethnolinguistic groups, Indo-European and Dravidic, which points to an initially greater expansion of Indo-European speakers, and later resurge of Dravidian languages. 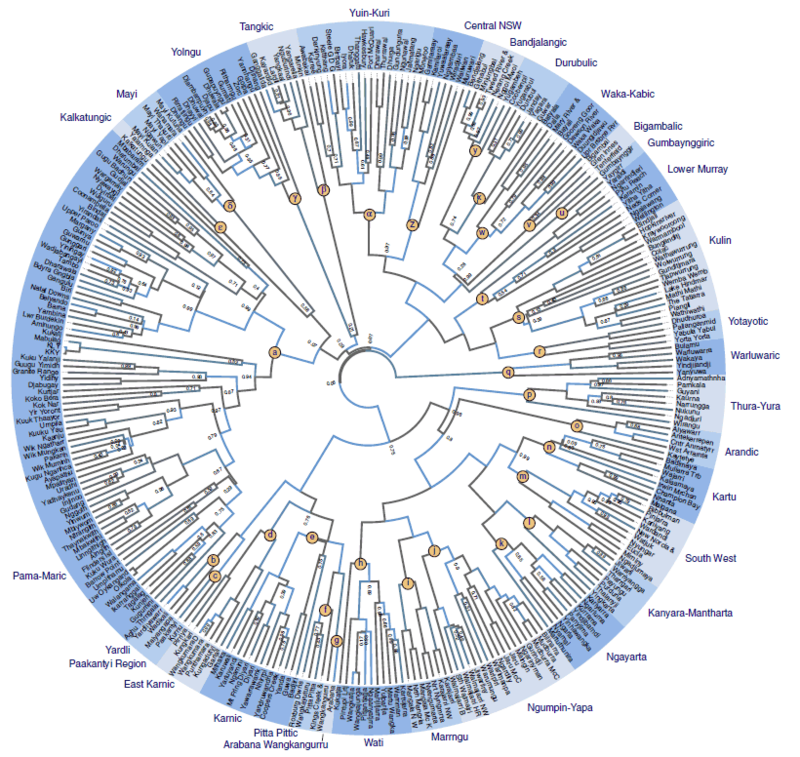 Featured image contains simplified origin and data of samples studied, from the article. The shard was found by a teenage volunteer during a dig about 20km (12 miles) south-west of Jerusalem. Experts at Hebrew University said dating showed it was written 3,000 years ago – about 1,000 years earlier than the Dead Sea Scrolls. Other scientists cautioned that further study was needed to understand it. Preliminary investigations since the shard was found in July have deciphered some words, including judge, slave and king. The characters are written in Proto-Canaanite, a precursor of the Hebrew alphabet. I found it interesting because of the implications that these findings might have on classifications of dead languages into more natural or artificial regarding the knowledge we have of them, especially about proto-languages like Proto-Canaanite (or Europe’s Indo-European), which can easily move from category 9 (‘hypothetical language’) to category 8 or even 7 (‘dead language’). As we have said before, this implies that, despite the efforts of some conlangers to make their newly created conlangs (look) the same as proto-languages like PIE – in the sense of ‘artificiality’, they obviously aren’t.